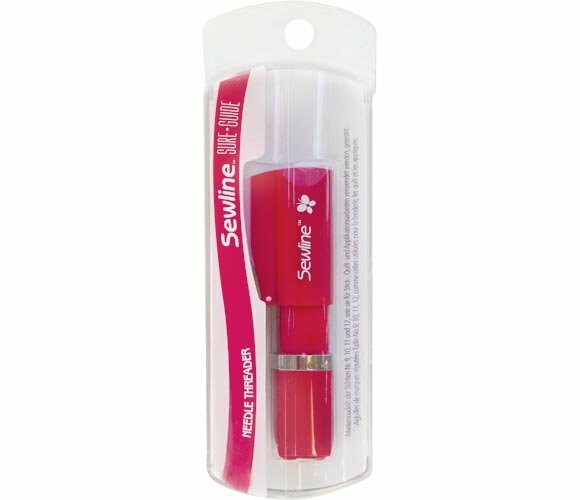 Sewline's new, improved model for threading fine needles size 9-12. The case slides open to reveal a clever mechanism. Simply insert the needle with the eye facing open to the threader pin, push down on the lever to test. If you feel resistance, Stop, the needle is not correctly aligned. Realign needle and retest. Once correctly aligned, lay the thread into the “V” groove. Then press the lever to guide the threader pin and thread through the needle eye. Remove the now threaded needle. The new “sure guide” button ensures that if the needle is inserted incorrectly, the threader pin is protected. However, care must still be taken to ensure the needle eye is open to the threader pin. Use with a gentle touch, do not force. We recommend you view the demonstration video to ensure correct use. The bottom of the case hides a clever storage area and handy magnet. There is a thread cutter on the underside. This cute threader is a must for any sewing basket.